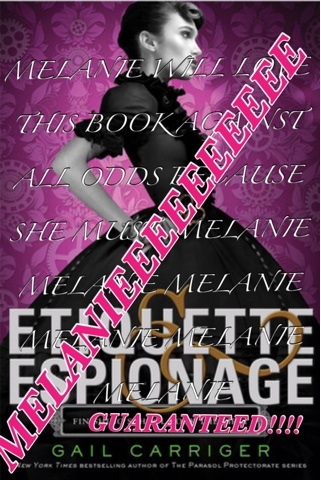 I took the big mistake when I read Marie Lu being quoted on my copy of Etiquette & Espionage. “I wish I could attend a school as fun as this finishing academy. It is the perfect steam punk version of Harry Potter.” After observing this, I assumed that the book was just as good as Harry Potter. RIIIGHT?! It literally has my name written all over it. NO. I was wrong. 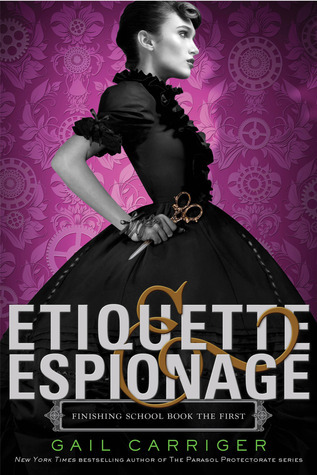 The prequel the Gail Carriger’s adult series (which I haven’t read), is based upon a finishing school that teaches more than just etiquette, but also some espionage that of course, must be executed in a lady like manner. When 14 year old Sophronia is washed off to Mademoiselle Geraldine’s Finishing Academy for Young Ladies of Quality, she finds that it wasn’t exactly what her mother has been hoping for. Yes, the finishing school does teach some proper manners, but there are secrets hidden that even the headmistress may not be aware of. Our main character, Sophronia is a very queer one to analyse. In fact, she reminds me a little of Sara Crewe from A Little Princess. She was reserved, kind and held a slight tinge of humour to her that made Sophronia less ‘Victorian’ like. After all, she at the beginning does get Indian rubber of her shoes from playing in the dumbwaiter. Yet also, Sophronia seemed a little unstable; her character was shaky, sometimes, it was difficult to pin point exactly whether I liked her or not. Nonetheless, she was predominately likeable. The problem of Etiquette & Espionage was, and why it made everything horrible, was the lack of activity and motion. With the addition of unique/olden writing style that took sometime to adjust then love, I felt distant and reluctant to continue on each page. There was no plot. As much as I wanted to admire Gail’s story, the synopsis at the back of the book did not match with the novel itself. Moreover, even at the tiny excepts of engagement, it was uneven. Rather bumpy to be exact. Smoothing down the writing would have been of great benefit for Etiquette & Espionage. For my first book by Gail Carriger, I am utmost disappointed. Though I hear her adult series is much better so I will consider reading that instead. A mix of steampunk, history and paranormal fiction, Gail failed to impress with her cover and entrapping blurb. While I won’t recommend this, I will stick around for book two! I’ve heard mixed thoughts on Etiquette and Espionage. I was really thinking that you were going to love it- turns out I was wrong :/ I still think you should try reading the adult series. My wife read them and she said it was really well crafted. Hope it gets better! Sophronia sounds pretty promising, looks like it’s just the writing and plot…. You got that right Ben. You still considering this one? Hehe 🙂 Sara Crewe is the best!!! Good to hear that you are still safe! & that you at least got some sunshine. I seriously hope the storms do pass you soon, so you can get yourself back into a normal routine once again! Aw, that’s too bad. I have to admit though, this book has one rockin’ cover. I’ve heard so much about this author and her previous series, but not so much about this one. It doesn’t sound like the best book, sorry you didn’t enjoy it, it can be hard when there’s little to no plot. So sorry that this didn’t impress you… but I love your review! Like always, so much fun to read. 🙂 This hasn’t been getting the best feedback, so I don’t think I’ll be picking it up any time soon. Thanks for your honest thoughts! I agree with you, this was nothing like I expected. The lack of an actual plot killed this book for me, and even Carriger’s famous sense of humor just didn’t work in this case. Her plotting was never something to write home about, but it was never this bad either. ah, well. Sorry we both wasted our time.